Any of us may ask that question sooner or later. It’s a question the black community is asking today in their push-back against 400 years of continuing racism and oppression. It can come up for any of us when we realize the years behind us outnumber the years ahead and our dream isn’t being fulfilled the way we thought it would be. It’s the question we ask when we wonder if the dream was an illusion, and a new vision of what will be hasn’t yet taken the place of what’s being lost. The church was asking that question a generation after Jesus talked about the nearness of the kingdom of God. What happens when the promise of life in all its fullness gets deferred to a time so far in the future we don’t know if we’ll ever see it? The infant church remembered Paul’s assurance, “We will not all die, but we will all be changed, in a moment, in the twinkling of an eye, at the last trumpet” (1 Cor. 15:51-52), and now they were all dying, all of them, and the trumpet had not sounded. What do we do when the dream shrivels up and the fire fades and the dream still has not be realized? Sometimes even a little faith is hard to come by. That’s when we need the example of others whose faith shaped our hearts. Remember the faith of your grandmother Lois and your mother Eunice, Paul wrote to Timothy. Remember the passionate trust in God that flamed up in those who passed their faith on to you and that still burns in living memory, a passionate trust that can still ignite our spirits. Find people in this or some previous generation who can help you rekindle such faith; spend time with them or with their legacies; listen to the truth they embodied and passed on to you. One of those people for me was my grandmother Edith. 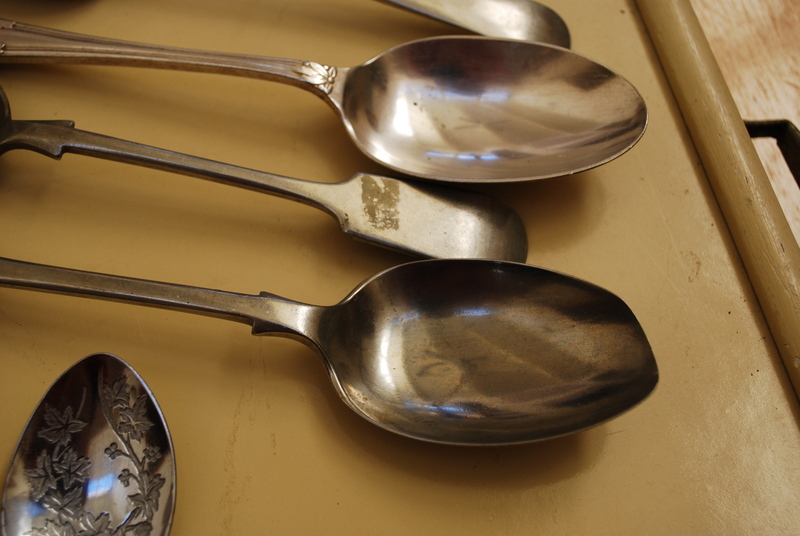 Perhaps the most precious possession she left was her faith, symbolized by an old kitchen spoon. Dulled with age and worn flat on one side by decades of stirring whatever was cooking on her stove, it would hardly have rated a second glance at a garage sale. But to us who know the story of that old spoon, it’s priceless. Starting before the Great Depression and continuing past World War II, it wasn’t only herself and her six children Edith fed – including my mother, the youngest, who in the early years was still an infant. There was always enough at her table for the occasional unemployed traveler, and for neighboring children who would stop in for breakfast on their way to school, and for the ancient woman I knew only as Aunt Tiny, a neighbor with no family for whom my grandmother provided simple room and board. The times were hard, the resources meager and precious, and I don’t know how she managed. But in her love for those who shared life with her in that little West Tennessee community and who had needs at least as great as her own, there was always room at her table for anyone who was hungry. She never explained her motives in my hearing. She may have known the word “theology,” but I never heard her use it. But when a neighbor had a need and she had something extra, she shared it, and both she and the neighbor were blessed, and they were both grateful, and in that simple exchange Eucharist was celebrated. When the author of 2 Timothy writes about the “sound teaching” that’s to be passed from one generation to the next, he doesn’t start by laying out doctrine; he starts by naming people – Timothy’s grandmother Lois and his mother Eunice. I believe the treasure we have from earlier generations and are now passing on to others is not unchanging law written on stone; it‘s the treasure of a kind of relationship embodied in the human heart, the kind of faith embodied in Timothy’s grandmother Lois and in my grandmother Edith. Recently I asked one of you what it means for you to be a disciple of Jesus, and you immediately spoke not about theology or doctrine but about your relationships with members of this congregation, life-giving relationships in which differences of opinion are recognized and affirmed in the context of genuine care for others. I think Paul and Lois and Eunice would have nodded their approval. So would my grandmother Edith Fullerton, who gave me the best single piece of advice I’ve ever received about being a pastor. “Love the people,” she said. Value the people, and you will feast at the groaning board of God’s grace. There is a good treasure worth guarding.